Okay. So this is the last page, sort of. After taking some time to think about it, I have made a couple of decisions. First, I think I'm going to go back and completely rewrite and redraw Chapter 0. It was the most experimental part of this experiment, and it's terrible in indescribable ways. When I'm finished, I'll replace the current Chapter 0. I'll be sure to make a new post so it pings your RSS feeds and such! After that, I plan to retouch Chapters 1-8. Not rewrite or redraw, just touch up the lineart where it's roughest and recolor the grey shades to proper screentones. After that... 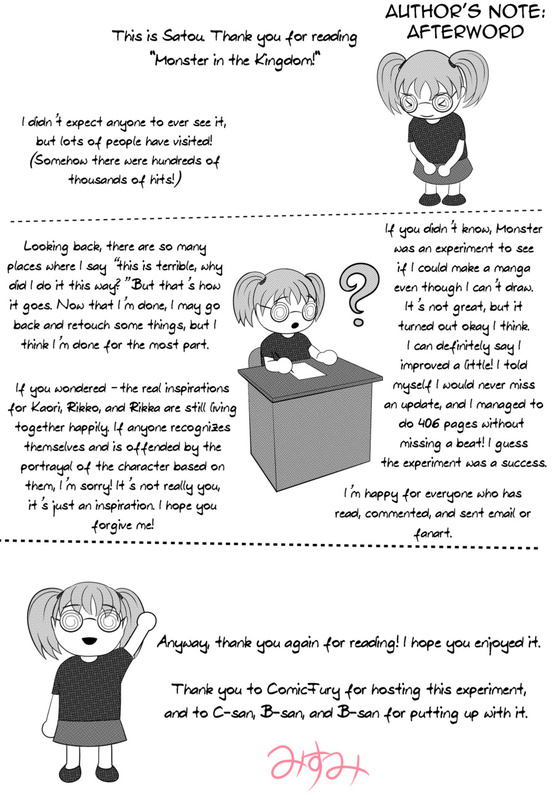 I have a few ideas for one or two more side chapters about Chika-chan's story, or a few other ideas. I haven't decided.